AUGUSTA, Maine – The fourth annual Maine Open Lighthouse Day will take place rain or shine Sept. 15, with many of the state’s coastal, island and river lighthouses planning to welcome the public for tours and special activities. More than 15,000 people visited 24 open light stations during last year’s event, and 4,100 people climbed light towers for the lantern room view. The event is coordinated by the U.S. Coast Guard, in partnership with the Maine Office of Tourism and the American Lighthouse Foundation. It is the largest event of its kind in the country. Most lights will be open to visitors from 9 a.m. to 3 p.m. for guided or self-guided tours of keeper’s houses and light towers. Some light stations will have limited accessibility or special restrictions. 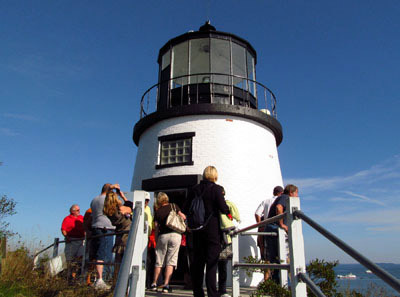 The event website, www.lighthouseday.com, will soon have details about visitor hours, fees, activities and transportation to each participating lighthouse. People can also contact the friends group of an individual light for more information. Maine lighthouse fans can learn about participating lights and share their Lighthouse Day plans on the event Facebook page at www.facebook.com/MaineOpenLighthouseDay. More than half of the 55 working lighthouses in Maine are accessible to the public during the summer months thanks in part to programs like the landmark Maine Lights Program passed by Congress in 1996. The program transferred the ownership of lighthouses from the Coast Guard to local preservation groups and organizations like the American Lighthouse Foundation, and served as a model for the National Historic Lighthouse Preservation Act of 2000. Note: Approximately 300 tickets will be made available for visitors on a first-come-first serve basis the day of the event, which are necessary for climbing the tower. Last year I visited three of Maine’s lighthouses on Open Lighthouse Day. At each lighthouse the volunteers were friendly and the staffing levels were more than adequate. The day was also blessed with great weather. This is an opportunity for anyone to get out and enjoy some of Maine’s best, our lighthouses.